Race Brook Falls campsite, southwest Massachusetts. 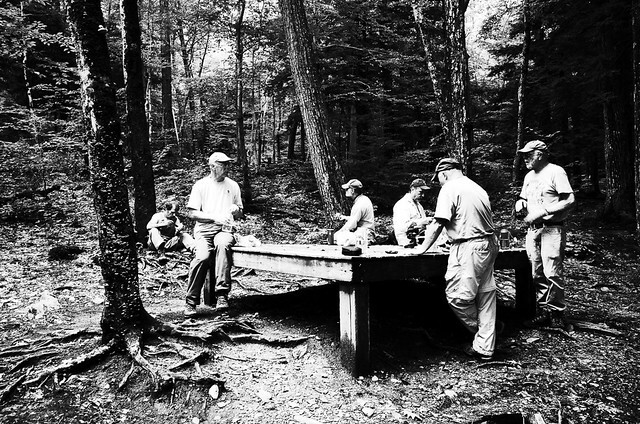 For the past three years I’ve been a volunteer for the Berkshire AMC (Appalachian Mountain Club) and have been maintaining some trails and a few campsites. Besides the regular hikes to check the trails and campsites groups of us do larger projects. Yesterday, this group moved and rebuilt a rotting tent platform (similar to the one they’re sitting on here). This is a simple task in a back yard but a few miles up a steep trail it becomes a bit tougher logistically. We carried a lot of lumber and tools up and got it all done. I’ve done other projects with this group, including the building of a new log bridge on this trail which was great fun. Most of the guys in this group are older and retired (we had an 80 year old working on the bridge) and I have to say, doing things like this with them is something I look forward to. I always learn a lot and have a great time. I liked the “old time” feel the high contrast black and white filter on the Ricoh GR gave this image.